Rabbi Kenneth Auman was elected to be our spiritual leader upon the retirement of our Rabbi Emeritus, Rabbi Solomon J. Sharfman “. He has been a capable and worthy successor, as his many years of loyal and devoted service, energy and enthusiasm, wisdom coupled with his warm compassionate personality, has earned him the respect and admiration of his congregants and colleagues alike. Rabbi Auman, a native of Borough Park, earned his Semichah and also a master’s degree in Jewish History from Yeshiva University His first position was at the Young Israel of Stamford, Connecticut, and he came to our Synagogue, for Rosh Hashanah 1984. Rabbi Auman possesses indefatigable and boundless energy. You can set your clock to his punctuality as he is never late for davening or an appointment. He is on the go from the crack of dawn, often until midnight, tending to the needs of the congregation. Over the years, he has distinguished himself as an educator par excellence. He taught at the Ramaz school and now at Stern College for Women. These positions have given him invaluable teaching experiences and his style, coupled with his vast knowledge, humor and ability to relate to his listeners, have made him a sought after speaker. The breadth and scope of his knowledge is well known, as is his mastery of history, halachach and hashkafah. Very often, when he teaches Shiurim or delivers a lecture, his audience is held spellbound as he is conversant in a wide variety of topics; from historical and Talmudic texts, to current and contemporary issues affecting the Jewish community Israel and world events. He is a master teacher and a confident and articulate speaker. His photographic mind, instant recall of events and ability to remember names and places, continues to amaze us. Sometimes, he’s called upon to read from the Torah on a Shabbos morning, occasionally on a moment’s notice, and his laining is masterful and flawless, as is his reading of the Megillah. The Rabbi, not being satisfied with certain Kashrut standards in the community has strengthened the Kosher supervision in our community and has taken strong positions in order to maintain the highest levels of Kashrut. His warmth and involvement with the congregation and his ability to relate with each and every one of them, from young to old, are among his most special traits. He always greets you with a big smile, inquiring about your family He is constantly on the phone conversing with the elderly or infirm. If the Rabbi is unsure of an answer to a difficult question, he’ll do the research and obtain the proper response. When greeting youngsters, or strangers, he immediately makes them feel at home with his warmth and engaging personality. In addition to his manifold duties in the synagogue, teaching classes, innovating Torah programs, counseling, hospital visits, and officiating at life cycle events, the Rabbi has also been active on a community wide level. He has played a most important role in the maintenance of the Greater Flatbush Eruv. 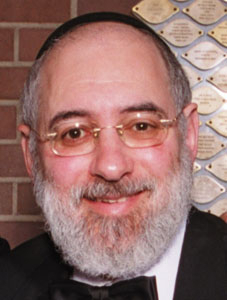 Rabbi Auman has served as President of the Vaad Harabanim of Flatbush, established the Kehillah Kashrus Rabbinical Board, served as the Rabbinic Advisor of the Get Organization, and previously served as the President of the prestigious Rabbinical Council of America.